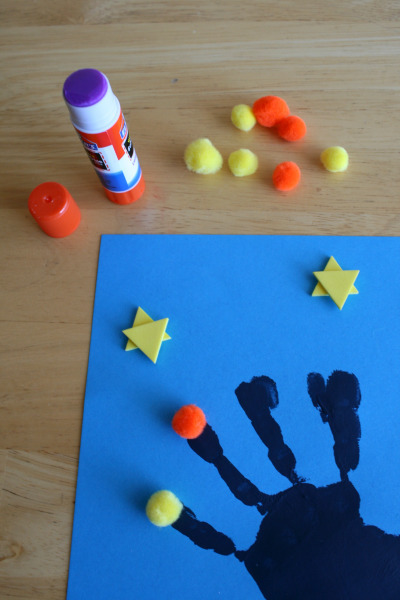 If you’re celebrating Hanukkah with little children, but you don’t want them around candles or fire, this is a fun craft to let them be involved. They can glue on a little fuzzy pom pom each night for 8 days of Hanukkah. 2. 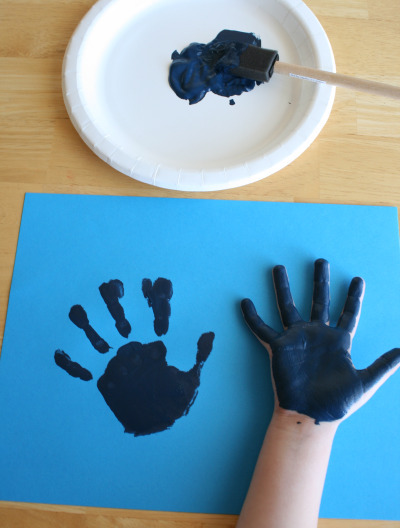 One hand at a time, I help guide and press my child’s hand on the paper. Being very careful with the first hand (so as not to get paint on anything), we do the same thing again with the second hand: paint, guide, press. You’ll want to make the thumbs overlap, so it’s only 9 places for candles, not 10. The thumb candle in the middle represents the “shamash” or the worker candle that lights the other candles during Hanukkah. 3. 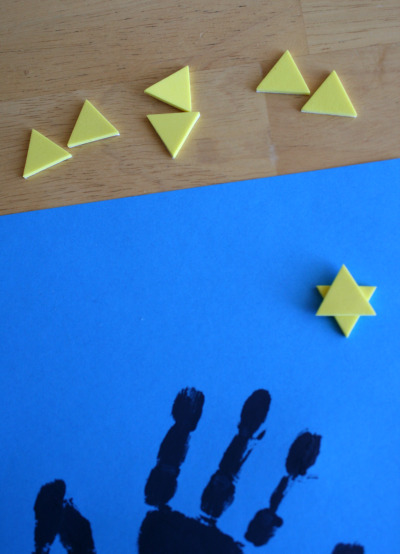 We decorated our paper with Jewish stars forming two yellow triangles on top and opposite of each other. 4. To light the menorah for each day of Hanukkah, glue on a fuzzy pom pom (we put ours in a fun yellow/orange pattern). 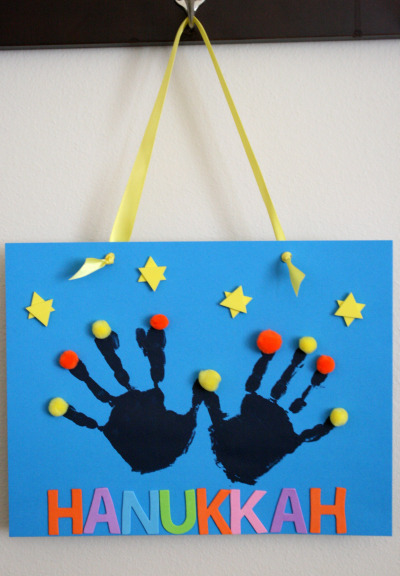 Instead of pom poms, you could also get out some yellow paint and use your child’s thumbprint for the flame, they could put on a triangle sticker, or even simply draw a candle’s flame for each night. 5. We’ve added letters to spell Hanukkah on our paper at the bottom. We also paper punched 2 holes at the top and tied ribbon to make it a hanging banner. This is a fun book I like to read to my children to help them learn a little more about Hanukkah. 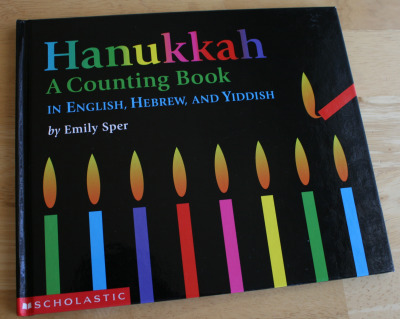 It’s called Hanukkah a Counting Book by Emily Sper. 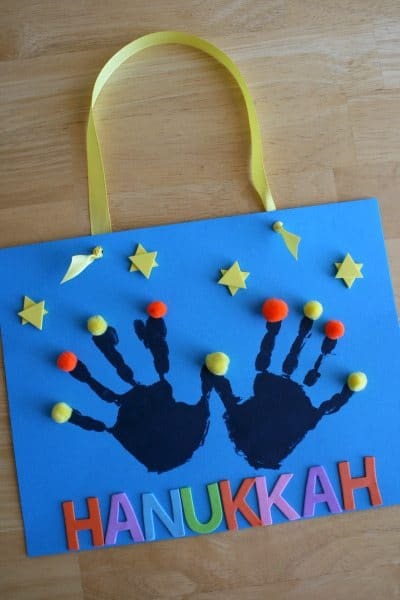 Enjoy teaching and celebrating Hanukkah with your children. They’ll love being able to help with the process. 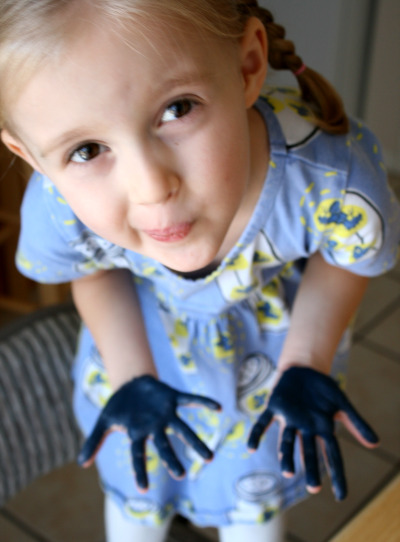 Marie is a crafty mama; you can find her at her daily site Make and Takes.